This aluminium pontoon boat is powered by twin water jet engines rather than propeller engines, allowing it to access areas that other boats can't go. These cruises are operated on a 28ft twin aluminium pontoon boat. The twin 60hp Yamaha engines have been fitted with aqua jets rather than propellers, this unique feature enables these boats to navigate parts of the river that the other cruise boats can't go. Because of this adaptation these boats are called jetboats, but the term jetboat is misleading as it conjures up images of hurtling through rapids at high speed, making 180 degree turns on a dime and getting very wet. 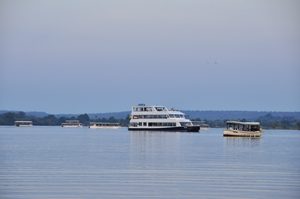 This couldn't be further from the truth as these cruises are very sedate and relaxing, meandering slowly through the channels of the upper Zambezi River. 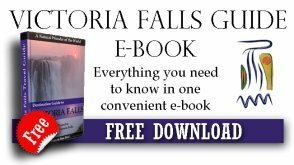 Almost everyone who visits Victoria Falls goes on a sunset cruise on the Zambezi River, those cruises are often packaged together with other activities and sometimes thrown in as a freebie. But those boats are generally large pontoons with deep draughts and propeller driven engines. 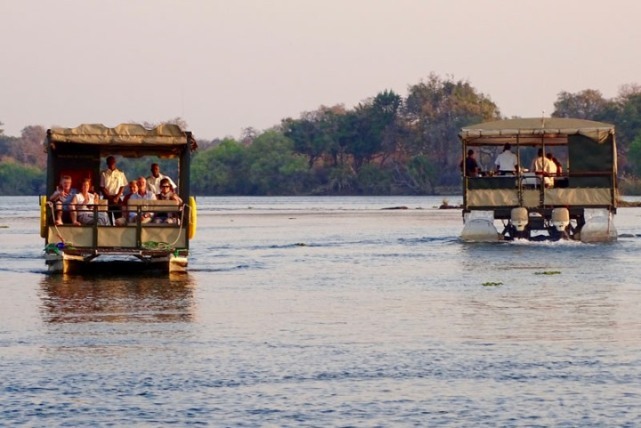 As much of the upper Zambezi is rocky and shallow, only a short 5 km stretch of river around Long Island has a deep enough channel for these large boats to navigate. There are possibly 15 to 20 companies that operate sunset cruises, which means this small section of river gets quite congested with boats going backwards and forwards. Don't get me wrong these are pleasant cruises and enjoyed by many, but if it were me and I had the choice I would pay the marginally higher price and go with the jetboat. I felt kind of privileged as we left all the other larger boats behind and headed into our own section of the river away from the maddening crowd. Being smaller than all the other boats it felt more intimate - a thoroughly enjoyable experience. The jetboat departs from a jetty amongst all the other sunset cruises but after a short cruise downstream it breaks through a narrow channel navigating around and cluster of rocks which forms the natural barricade for the bigger boats and leaves them behind. The Jetboat is now on it's own and begins its exploration of the islands above the Victoria Falls. The experienced captain manoeuvres the jetboat expertly through the channels searching for birds and wildlife. The scenery is just beautiful especially in the warm sunlight of the African afternoon and the rising spray of the Falls is always evident further downstream. One can't help but to ponder that this was the exact view Dr David Livingstone had as he approached the Falls for the very first time on 15th November 1855 moments before becoming the first white person ever to see the Falls. The boat has a maximum capacity of 16 people, ideal for small groups with a feeling of having your own private cruise. On the cruise clients will be provided with a choice of local and imported drinks from 5 different spirits, 4 different beers, red and white wine and varied soft drinks, with snacks. Return transfers from your hotel to the jetty are included. There is also a toilet on board. The jetboat sunset cruise times vary with the seasons. Times are from leaving the jetty to returning to the jetty. Summer 16h30 till 18h30 and Winter 16h00 till 18h00. Private cruises and fishing trips can be arranged by special request. The Victoria is the upmarket version of the jetboat cruise described above, but with a maximum capacity of 20 passengers. 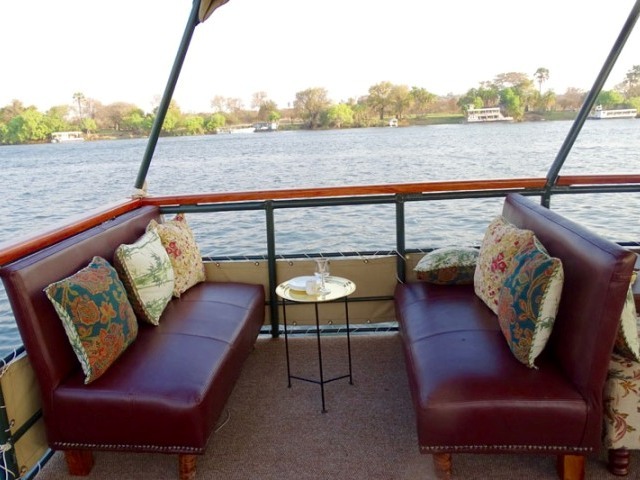 It is jet propelled, making it the only luxury safari boat that is able to access the part of the Zambezi River that is very close to the edge of the Victoria Falls and the islands in that area. It combines exclusivity with luxury. 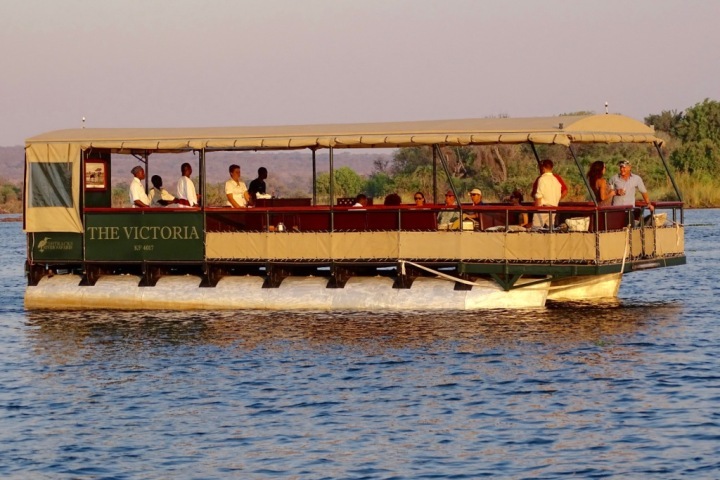 The Victoria offers a very comfortable sunset cruise while taking you downstream towards the rising spray of the Victoria Falls. 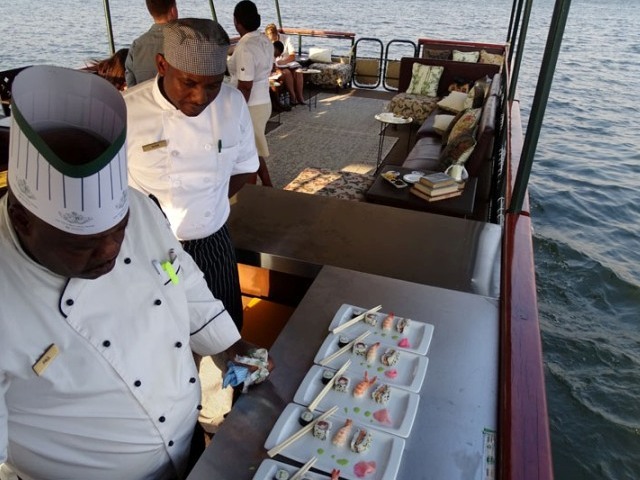 While cruising, a chef from the Victoria Falls Hotel prepares sushi "and other gourmet canapés". It is a romantic experience infused with a touch of history. 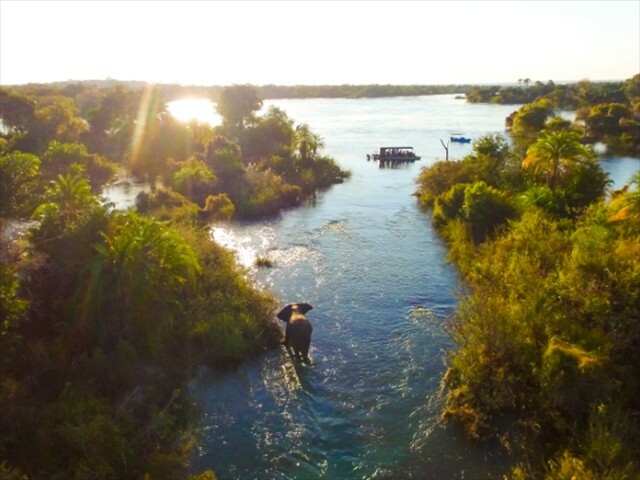 Meandering through the islands on the Zambezi River, you may spot elephants crossing part of the river that David Livingstone took when he first arrived at this magnificent waterfall.